This is a new Mitsubishi 650nm 200mw laser raw diode suitable for the Kip Kay instructable project or in any other application where it may be needed. Suitable for use with our red driver boards. 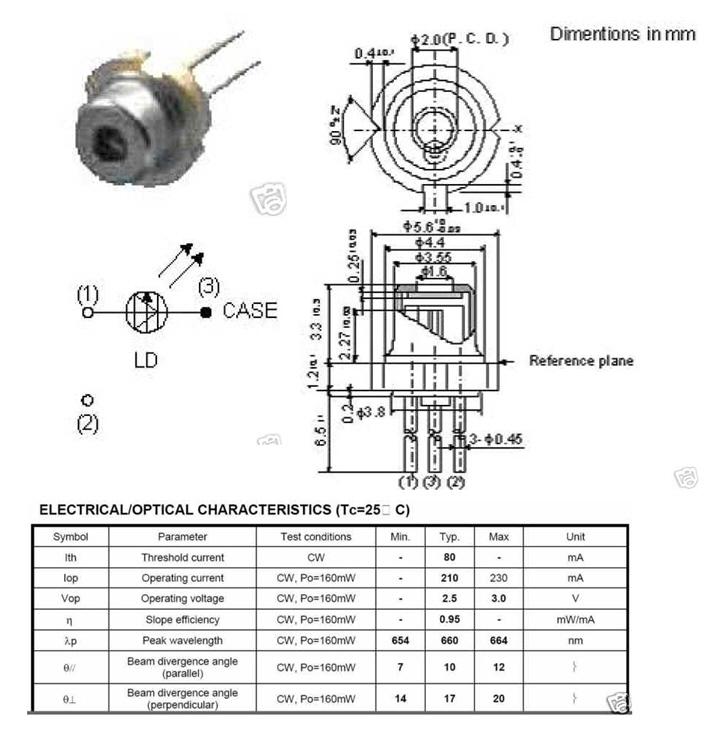 DESCRIPTION The LD-660nm-200mw is a high-power, high-efficient AlGaInP semiconductor laser which provides a stable, single transverse mode oscillation with emission wavelength of 658nm and standard pulse light output of 350mW. The LD-660nm-200mw has a real-index-waveguide which improves the slope efficiency (reduction of the operating current) and the astigmatic distance. Also, LD-660nm-200mw has a window-mirror-facet which improvesthe maximum output power. That leads to highly reliable and high-power operation at 75C.